Is Conshohocken Coming Back, Or Just Being Taken Over? Part V: Residence and Recreation…For The Favored Few? I introduced my series of blog posts about Conshohocken on October 24th by pointing out one of the 180 degree changes time has wrought on the lower Schuylkill Valley. I was talking about how what had historically been the lowest priorities for the riverbanks of every town—residence and recreation—were now the highest. All should be happy to hear that the new development is producing open space and recreation opportunities along Conshohocken’s riverbank, where they have never been before. I am all about alternative transportation, open space and community recreation, and so I applaud these aspects of what seems to be emerging in Conshohocken. Unfortunately, I also have my suspicions that all three may prove to be less significant builders of community than is everywhere else the case. "Are we okay with taking the river away from the people?" The specific subject was O’Neill’s proposed almost-600 unit apartment complex, but the question is appropriate for the entire waterfront. The old, dirty vestiges of an industrial past are almost gone. Conshohocken’s riverfront is seeing—and will soon see more—new buildings, either residences or workplaces. As virtually the entire riverfront is being redeveloped, isn’t it at least theoretically possible for Borough Council to foster that development with the whole community in mind? This would have been unthinkable in “the good old days,” but isn’t this a rare—almost unique—opportunity to visualize the new Conshohocken as an integrated, vibrant community and to take actions to ensure development proceeds along that route? Time for a reality check. 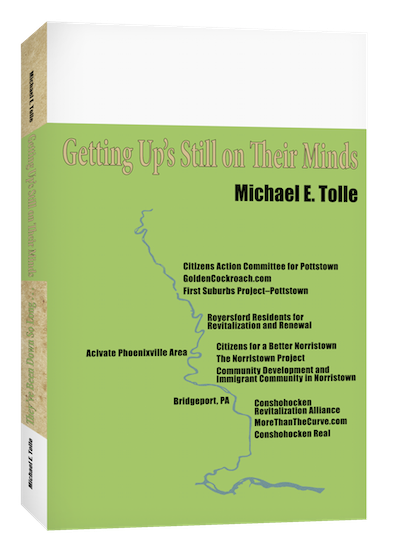 First, “Conshohocken Real” phrased the issue in a rather populist manner, and as a historian I am compelled to point out that you cannot take something away from those who never possessed it in the first place, and “the people” of Conshohocken never possessed the riverfront. Yes, a few did, due to our private property/free enterprise system, but they did not purchase it for either their own residence or the recreation of others. 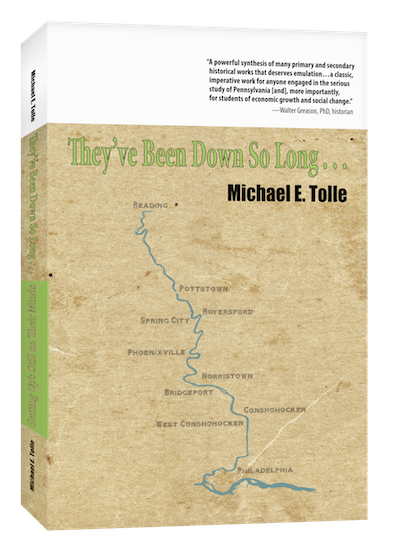 By the time they had installed their railroads, furnaces, foundries and power looms, no one with any money wanted to either live or recreate along the river anyway, so the issue never really came up. Second, Conshohocken has already had the opportunity to design and build a planned, integrated development of just a portion of the land being affected now, and it didn’t happen, largely (but not entirely) because of timing. The Borough is now doing it the old fashioned way, parcel by parcel, with purpose and implementation under the control of each individual applicant who owns each parcel. What is built where will have nothing to do with community needs, but will be strictly a function of the most profitable use of a particular piece of property. Writ large, it’s “The American Way,” in an interpretation recently demonstrating political strength. It has produced in Conshohocken where community planning failed, and it will continue to dictate both the product and the pace. Thus the riverfront is again being carved up as private property because, in truth, it never ceased to be that. Still, developers know that inclusion of terms like “open space,” “recreation,” and the like help to smooth the application process, so expressions of these terms are sprinkled among the buildings that appear in the conceptual drawings. That’s why O’Neill’s current proposal for not quite 600 new apartments comes with a “boardwalk” and a dock. I suspect that the details of both these concepts are still somewhat hazy. A boardwalk could mean anything, and as a long-time resident along the river, I can assure you that a public dock without a nearby public boat ramp is pretty much just a site to fish from. The larger question is not about the nature of the benefits themselves, but in who will have access to them. A beautiful riverside view must be purchased (or rented), and individual companies will determine who gets the best view from their new office buildings. As for recreation, the story is more complex. Access will vary according to the activity, at least to some extent. Consider that time-honored Pennsylvania sport, rowing. A Borough-owned strip of riverfront land will house the “Conshohocken Rowing Center.” The building itself is financed by the two schools whose rowing programs it will house, Malvern Prep and the Haverford School. Those are pretty upscale, not to mention private, programs (okay, rowing is a pretty upscale sport), but a community rowing program is supposed to be included. Sounds good for a limited number of people. But how about more common, less specialized utilization of open space and recreational areas? What other more broadly based recreational opportunities could be made available along the river, and what will it take to bring them about? Then there is the question of broad community access to these benefits. They will all be located in the lower valley. How easy will it be for the residents up the hill to utilize them, meaning actually get to them? How many wide, busy streets will they have to cross? Will the new recreational benefits help to unite The New and The Old, or will they give The New a privilege by location, further dividing them? The Conshohocken Rowing Center is a good idea, but it is also evidence that even outsiders can obtain access to the river by paying money. Is money to be the operative factor? Questions are easy to ask, particularly semi-rhetorical ones like those above. When we begin to get into the issue of responsibility for actually achieving what we want--or failing to--we must simultaneously examine the restraints those in positions of responsibility must operate within. That means the second point of my reality check above deserves greater scrutiny. It will be all too easy to place blame incorrectly for what is probably going to happen. So, I will conclude my blog series on Conshohocken next week by throwing the wet blanket of reality over the chances of obtaining the utopia I have spent the previous weeks promoting. It's my way of balancing the books. I have been sounding the alarm these past few weeks about the downside to what is happening near the Conshohocken exit of the Interstates in Southeastern Pennsylvania. I have suggested that the Borough faces—right now—decisions that will determine its future, and have phrased that future as a choice: either a community, or just an exit off the Interstates. Nothing is quite so simple, of course, and to give an example, I am going to clarify my stance on the all-important issue of transportation by making the apparently counterintuitive argument that Conshohocken can be more of a of a community if it becomes more of an exit. This does not apply to the automobile; the choice it presents is both stark and clear, and is as I have expressed it. The more that Conshohocken structures itself to accommodate the automobile the more it mortgages its future as a community. It most definitely applies to what we today call “alternative transportation.” Conshohocken is doubly blessed in this regard, and should work to take greater advantage of that fortuitous fact. The Borough as a community can only benefit. I have previously made the point that “A livable town is a walkable town.” Today, walking counts as alternative transportation, along with bicycling and public transit. This is but one of the many 180 degree turns that history has made along the Schuylkill River. What had been the primary means of transportation during the glory days of the Schuylkill River towns has all but disappeared, but its remnants constitute the core of what we today call “alternative.” In the old days, the railroad delivered everything, from raw materials into the towns and factories to finished products from them to the world. Its lighter cousins, in turn, knit Conshohocken into a regional network. They delivered the better off to their jobs during the week and all classes of workers to the countryside for recreation on the weekends. The bicycle fad preceded the automobile fad, and even a few adventurous women joined in. Still, when all is said and done, walking was the primary means of transportation for the vast majority of Conshohocken residents. They walked to work, they walked to shop and they walked to visit friends in the neighborhood. The result? The proud, tightly-knit, community-centered population of Conshohocken, Pa. But that was then. This is now, and things have changed. The rail era is over. Light rail is gone, and isn’t coming back anytime soon. But a survivor, the Norristown Regional Rail Line (I still want to call it the R6), still delivers people to and from the Borough. This is a means of transportation to which Conshohocken should want to be even more of an exit than it is today. Every new rider is one less driver congesting the roads. I would like to think that a portion of The New coming to the Conshohockens to either live or to work will arrive and leave on it. It’s a limited connection, but only Norristown has anything better, and it’s just upriver on the same Regional Rail Line that passes through Conshohocken. The railroad has also delivered to Conshohocken two other form of alternative transportation, albeit rather indirectly. I speak of the old mainstay and one not nearly so old but experiencing quite a comeback, i.e., walking and bicycling. Back in the old days, two railroads ran through Conshohocken. The trackbed of the Reading is now the Norristown line, but that of the long-gone Pennsylvania Railroad now hosts The Schuylkill River Trail. Conshohocken was an early beneficiary, and as the trail has been extended, improved and connected, the number of people employing “alternative transportation” through town has steadily increased. Businesses that cater to trail users are beginning to find Conshohocken a potentially profitable location. The current campaign to bring a bicycle shop to the Borough is an early sign of what will happen. The New that will reside along the riverbank will find the Schuylkill Valley Trail to be convenient, perhaps even enticing, as they are expected to be a younger demographic. Few will likely use it to commute to and from work, but weekends will be another story. Those who reside elsewhere and utilize the Trail (not all of whom ride bicycles) will likely find Conshohocken attractive, if just for a brief refreshment stop. The Borough’s scenic location will draw a great many people who will not arrive in motor vehicles. That’s all good; for them, and for the town. In marked contrast to my previous comments about an becoming an exit for automobiles, Conshohocken’s future as an exit on alternative transportation should actually be encouraged, for the general good of all. Whether you are riding on the train or moving yourself along the Trail, you are not contributing to traffic congestion, oil prices and environmental degradation, to name but three of many bad things. The latter two may be somewhat ephemeral for Conshohocken residents, but the first is emphatically real, and getting worse. Thus, the more who employ “alternative transportation” (this phrase sounds so strange to a historian) to or from their residences on weekdays or weekends, the better. But there is much more to the story, and additional reasons for promoting these old-but-back-to-being-popular means of getting around. “Alternative transportation” is also closely associated with improving urban livability. If anything should be obvious from a study of American history, this should be. Communities actually existed back when today’s alternative means of getting around was the primary one. It follows that while becoming more of an exit for alternative transportation will be a good thing, promoting alternative transportation within the Borough will be even better. It will be great to have riverfront businesses and residents benefitting from those who come and go, but it will be even better if Borough residents find it easy to get around town, and the riverfront benefits are shared. Let’s be realistic, of course. Old railroad trackbeds are perfect sites for bike and walking paths because trains could only surmount low grades. Much the same is true of the new users. Much of Conshohocken, in considerable contrast, sits on a steep hillside. Still, a great deal can be done for the area in which a considerable portion of the population are coming to reside, and decisions concerning roads in that area should take into account the transit needs of the residents of the whole town. This is where transportation becomes subsumed into a larger issue, that of community access to the riverfront. That issue most definitely needs to be addressed and I will do so in my next post. But for now, let’s accept two concepts: First, it will be a good thing if the new Conshohocken becomes as much an exit off the Schuylkill River Trail as it is off two Interstate highways. Second, it will be an even better thing if the new Conshohocken is structured to allow some old-fashioned ideas to demonstrate their current relevance. The first is going to happen regardless. The second will require action by the Borough Council, supported by the population, because it will be opposed by the developers. That makes it much less likely to happen. Conshohocken can only benefit by becoming friendlier to its readily available means of alternative transportation. It would be not just ironic but tragic if the community-building aspects of alternative transportation are shortchanged. If it only become much easier to leave or enter Conshohocken on foot or by bicycle than to get to other parts of town, then the full benefits of alternative transportation will not be realized. The age of the automobile and the Internet works against the human instinct for community. An emphasis on "alternative transportation" is a proven antidote to these decentralizing forces because it promotes both inter-personal and intra-community connections. Building both is essential if the new Conshohocken wants to call itself what the old Conshohocken certainly could: A COMMUNITY. Last week I closed with a promise to review a significant issue that is pitting The New versus The Old in Conshohocken. But let’s first establish a common goal for Conshohocken’s future. How about this: "A Community, Not An Exit." With that goal in mind, I will proceed to examine what I believe to a fundamental issue, one that will largely determine which of these two futures will prevail. Not only is this important, but it’s also being currently being decided. There is no time to waste. Last week’s hint was a lot more than that; this is all about the automobile. I want my underlying viewpoint to be clear from the outset. I contend that there is a fundamental contradiction between the urban grid and the automobile. The automobile is by far the least efficient means of getting people into and out of such a grid, and then there is the question of what to do with all those automobiles while their drivers are within the grid doing the various things that they do. 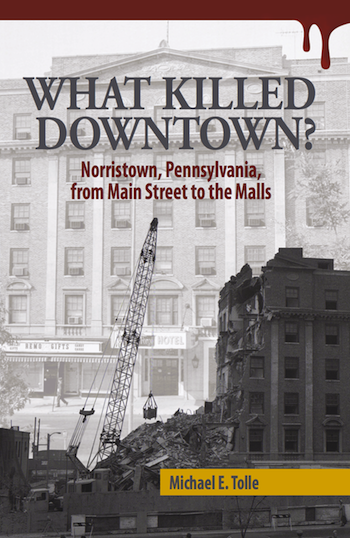 It’s the central theme of my book about Norristown, What Killed Downtown? and I believe it applies to Conshohocken, because it applies everywhere. My contention has a corollary that says when the number of tall buildings in an urban grid increases arithmetically, the contradiction increases exponentially. This corollary is clearly going to apply to Conshohocken also. Conshohocken, like every town on the lower Schuylkill, today faces its specific version of what I term “The Transportation Conundrum.” It’s a multi-faceted subject, and my upcoming book will discuss it more comprehensively, but for now I will sum it up in two words: Traffic and Parking. They are not just interrelated; they are two halves of the same walnut. They also stem from the same source: America’s current fascination with—and dependency on—the automobile. The automobile played a significant part in the decline of the old Conshohocken, because the town could not adapt to a changing culture where the automobile represented the future. Decisions taken now may once again place Conshohocken one step behind a changing culture. The irony lies in the fact that this time the automobile represents the past. Let me explain. The automobile—or, rather, or embrace of it—played a greater part in the decline of Conshohocken that is generally understood. Both the Conshohockens came into being and grew during the 19th century without regard to the automobile, because it didn’t exist. Their residents either walked or took what we today call “alternative transportation” to get to work or shopping. The result was a compact urban layout, with the industrial, commercial and lower-income residences placed as close to each other as possible. As the 20th century progressed, the increasing number of automobiles made this more and more of a problem and downtown began to suffer. Streets that had been perfectly adequate during the age of walking and public transportation could not handle even the fewer numbers who were going downtown in automobiles. Those new drivers didn’t like the traffic congestion, and found parking difficult. Downtown could not deliver sufficient improvements for either problem, so the shoppers began to drive their cars to the malls instead. The roads to them were bigger, and each had not only parking, but “free” parking. The tightly packed homes in Conshohocken, also built for people that did not own cars, began to have their own automobile-related problems. Parking was chief among them, and it remains so, but at least twice a day, traffic is a problem, one that is getting worse. Downtown’s parking problem disappeared with downtown, but that of residential Conshohocken did not. In response, what had been originally designed and built as public spaces—local streets—came to be conceived as the private property of two groups of people. Local homeowners claimed the outermost lanes in front of their homes for the parking of their automobile(s) when not being used. The middle lanes are reserved for those people operating their automobiles, many of whom are only using them to either get into or out of town as quickly as possible. Snow tends to exacerbate the problems for both. Today, Conshohocken is experiencing the highly unusual opportunity to build anew almost its entire lower floodplain, the core of that compact, urban layout. Proposals for residences, office buildings and even a hotel are pending, and there seems to be no end to the trend. This is important because decisions made right now will go a long way toward determining whether The Old and The New that I wrote about in previous weeks even have a chance of uniting in the new Conshohocken. These decisions involve the physical requirements for two separate priorities, and those requirements are antithetical. The issue is whether to prioritize the internal connections necessary for any sense of true community to arise, or the physical requirements for getting automobiles through town to one of the Interstates. In other words, what gets priority, the community or the automobile? Once these priorities are set in concrete, steel and asphalt, they will be next to impossible to change. The old Conshohocken, built before the automobile, could not adapt to it for many reasons, but large among them was the simple fact that it could not substantially change its layout, particularly the width of its streets, nor could it supply parking without removing the very businesses for which the parking was needed. New construction allows the parking half of the issue to be substantially dealt with, by simply including parking within the lot, if not the building itself. This is not true for the issue’s other half, traffic congestion. Here is where the difference between remembering history and understanding it comes in. Today we know that no matter what changes are made, no matter how much space is allotted to roads or ramps, it will never be enough. The United States has spent untold billions of dollars attempting to reconcile the urban grid and the automobile, and they have all failed. Priority allotted to roads separates and isolates communities, but always fails to deal adequately with the number of automobiles that will use them. It’s a lose-lose proposition. Conshohocken will experience increasing traffic congestion regardless of how much deference is given to streets, ramps and signals, while that deference will detract from its livability. "A once thought nearly impossible mission is quickly becoming a reality; the fusion of upper and lower Fayette Street is helping to achieve the goal of a walkable small-town Main Street." I want to ask my Conshohocken readers if the past two years have demonstrated this opinion to be true. I have my suspicions, not least because that two-year old post is also the last one ever to appear on the group’s Facebook page. The article itself was borrowed from another Facebook page, that of the “Conshohocken Revitalization Alliance.” It is still active, and may have perhaps changed its mind. A recent post in “Conshohocken Real” says traffic is bad, and getting worse. I have also heard from one reader that the Conshohocken Elementary School’s Halloween parade was relocated from Fayette Street to Harry Street due to parent concerns over safety. There’s a message emerging here. Here’s the irony of it all: today, many urban areas are reorienting themselves away from the automobile, and are, by this action, transforming themselves into more vibrant communities. The basic theme behind this movement is “A livable city is a walkable city,” and it applies to towns as well. For communities looking to the future, an automobile-oriented town is the New Old. Been there, tried to do that, failed. Yet Conshohocken, blessed with an almost unique opportunity to make its new version virtually anew, seems to be building it around what is now the old, discredited approach, giving priority to the automobile. The Conshohocken that results from such decisions will be an exit off the Interstate, not a community.